Please please why can I not get on your website. I desperately want to get two kimonos for next friday and cannot get on. I have bought from you before and your kimonos have been wonderful. BT have screwed up and my website cannot be reached until they fix it, which may take a couple of days. I’ve just been writing a blog about it to get it off my chest. I have emailed you to let you know what happened and that you can still get the kimonos on time, though. I’m sorry about this. I am furious with BT for their stupidity, it couldn’t have happened at a worse time. I have recently found an old pair of japanese shoes that my uncle brought back in either 1956 or 57. I was wondering if you could identify and give me an idea on their value. There are in mint condition. Thanks. I’m no expert and as for value, my prices are based mostly on my various costs, such as the item itself, business loan interests, site running costs, time put in to the business and various other things. You could perhaps look at my site and see if there is anything similar and judge by that. If the shoes are thong toed and wood soled with two little ‘stilts’, they are geta, if they are thong toed with solid wedge soles, they are zori (sometimes spelled zouri), if they are thong toed with extremely high, solid wood soles, they could be maiko okobo geta. I’m not good at dating footwear. hi blogger moderator! i just wanted to know where can i buy those traditional jap slippers? i’v been wanting to have 1 but there is none of them i can find especially the waraji tatami sandals and men’s geta!! 😀 please if u sell this slippers i’ll be glad to buy it :). thnx! 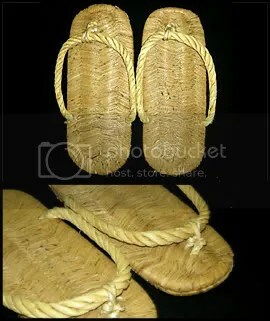 I only ever had one pair of tatami waraji sandals and those were sold a while ago. \my items are vintage, so I couldn’t order specific things, I just chose from a random selection available. I have a few men’s geta and a pair of setta available at http://www.wafuku.co.uk/index.php?c=47 but not much at all and it is all I have in my collection of stuff. I don’t know where you’d get any waraji, I’ve never come across others. Can you please tell me which shoes are worn in tradtional japanese dance? Note, in that clip, that their heels hang over the back of the geta soles, which is how they are traditionally worn, though not tied round the ankle, that is just done here to make it possible to dance like that in them, otherwise they would fall off. The 4 main guys dancing are called The Stripes. I love their dancing, pariculalrly in Tap vs Shamen; it’s worth looking that clip up on YouTube too. …but the more usual forms of traditional Japanese dance seem to be done in tabi. 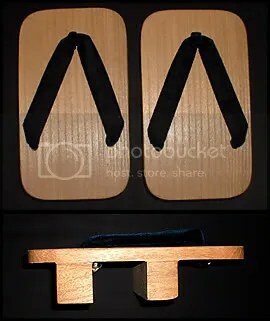 Is there anyway I can purchase a pair of koma geta (mitsu-ashi)? Any information would be greatly appreciated. Thank you in advance!!! I’m afraid I don’t know anywhere to buy those. “Traditional Japanese Footwear | Wafuku Blog” seriously got me personally simply addicted with ur web-site! I reallywill be back again significantly more frequently. I am really glad you like it. I have not written a blog post for quite a while, so it is time I added another to it. We have came across a geta that was found in the woods of Osaka Japan durring the 1940’s by a soldier. It is just one shoe. I’ve tried researching it and can not find any that has straps like it. Its straps are green braids and they are soft. I have pictures and would love for someone to help me find out. I have a question, I bought a kimono but didn’t buy the geta with it. Nor the tabi socks. I am going to a Obon Festival located in the Morikami Gardens in Florida. I would really love to wear my kimono to it. Am I able to wear western shoes with kimonos? And are there any restrictions on the way the hair should be worn? Well, I am certainly too late to answer this. I was not able to do anything with this blog for the best part of a year and have ust got back to it. I hope you enjoyed the Obon Festival. I doubt anyone at the festival would have minded if you wore Western shoes, I’ve seen some women in pictures from Japanese festivals who are wearing casual yukata type kimonos with Western sandals instead of geta. Yukata are very casual kimonos for wear at festivals (they are cotton and have no lining) and, being so casual, you can get away with more. The rules for kimono wearing, especially the more formal types, are many and complex. One rule you must never break, even with festival wear, is left front on top of right front, whether on a man or a woman. NEVER the other way, only corpses wear it the other way round. My daughter remembers which way by thinking of the phrase, left over rice, which is a phrase we heard used by a Japanese woman on YouTube, as a way of remembering. What type of Japanese footwear you wear depends on the type of kimono you have. Some Japanese people are now mixing contemporary/western shoes and garments with traditional Japanese clothing, so I don’t see why you shouldn’t. As for hair, I really don’t know. I would suggest doing an online image search of similar festivals to see what is being worn at those. I have a pair of geta which do not have straps or holes for straps. Very old, for a narrow foot (probably lady’s foot). Dark wood, painted design. Is there a way to send a picture to you? Have you heard of such a geta? I got them in Japan back in ’62, and they were old already. I have never heard of geta without straps. How do they stay on? Perhaps they are just unfinished. Sounds like unfinished would be a good theory, but they are certainly finished. I wonder if I have the right word (geta) for what they are. Maybe there was a kind that just tied on somehow, like a wrap. Except for the holes and straps, they are classic geta, and although not so small as a child’s foot, they are a little lady’s foot size. Having lived in Japan from ’64 to ’66, I saw a lot of little ladies. And little men. They’re not so small anymore. Thanks for writing. I’ve just discovered your blog while researching Japanese footwear. Thanks for the clear explanations and wonderful pictures. I am so glad that you like it and found it useful. I would like to inquire about the possibility of using one of your images for educational purposes. Is there an email I can contact you at?